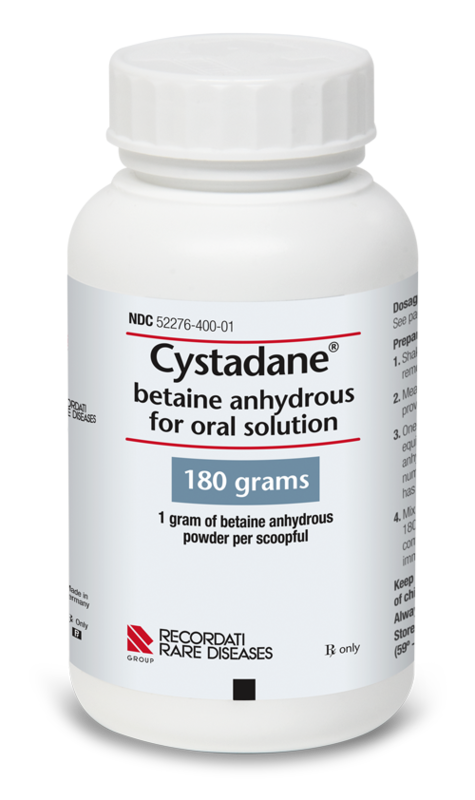 CYSTADANE is manufactured according to the high quality and consistency standards required for prescription drugs. What genetic disorders cause Homocystinuria? Hypermethioninemia in Patients with CBS Deficiency: CYSTADANE may worsen high methionine blood levels and accumulation of excess fluid in the brain has been reported. If you have been told you have CBS deficiency, your doctor will be monitoring your methionine blood levels to see if changes in your diet and dosage are necessary. Most common side effects were nausea and gastrointestinal distress, based on a survey of doctors. To report SUSPECTED SIDE EFFECTS, contact Recordati Rare Diseases Inc. at 1-888-575-8344, or FDA at 1‑800-FDA-1088 or www.fda.gov/medwatch. You are about to leave the Cystadane.com website and enter a website operated by an independent third party. The links to third-party websites contained on Cystadane.com are provided solely for your convenience. Recordati Rare Diseases does not control the opinions, claims or comments.ot control the opinions, claims or comments contained on any third-party website linked to Cystadane.com, and your activities at those websites will be governed by the policies and practices of those third parties.